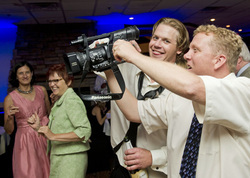 Richard (Rich) Wahl is the Owner, Chief Videographer and Editor at Moments Video Productions. Rich is responsible for Concept Development, Videography, Post-production, and DVD Design and Duplication. He has 12 years of full time video production experience in all aspects of the business and is committed to providing the very best state-of-the-art production for your special event. Email Rich using the Contact Us form here. To use the latest in High Definition digital imaging technology to produce high quality, long lasting video of your special event. As a graduate of Lakeland College with a bachelors degree in both Business Administration and Marketing, I had been working with computers and digital imagery for a number of years. Wanting to introduce my hobby to my background in business, I began creating a business plan sufficient enough to offer top-notch customer service and high quality video productions. In 2002, we began promoting and managing Moments Video Productions full time. Today we hold the same values that helped establish our business over a decade ago. Now in our 13th year of Business we pride ourselves on not only being on the cutting edge of video technology but also having the experience to handle any unanticipated situation. We've learned that quality customer service and only the best video productions will generate quality customers. We go to all lengths to create satisfied customers. Moments Video Productions invites you to give yourselves the gift that truly lasts a lifetime - a professionally produced and edited video of your wedding day. Video allows you to relive your wedding day as it happened with all the emotion, sounds and memories captured by our camera crew and presented in a cinematic tale. Your wedding day is a once in a lifetime event, while the photographer is an important part of your wedding day, the videographer is just as important. If you had the choice of looking at your parents wedding pictures or their wedding video, which would you choose? Of course you would choose the video because you would want to not only see but to also hear everything that happened on that special day. At Moments Video Productions we pride ourselves on unobtrusively capturing all the sights and sounds of your special day, many of our clients have commented that they did not even see us taking some of their favorite shots. We use modern High Definition Digital Video technology incorporating numerous types Digital Video Cameras. Our production facilities utilize the latest non-linear editing technology, and a wide variety of software applications to deliver your production in whatever format you would like whether that be DVD, Blu-Ray, thumb drive or a small portable external hard drive. Yes, Moments Video Productions uses professional wireless microphones in order to ensure that your vows are crisp and clear. We also tie into the sound equipment of the facility or the DJ if possible to get the best sound. We recognize that so many devices today can take relatively high quality video images but really lack quality audio. To make a production truly professional the audio must be of the highest quality, this is why you hire a professional.